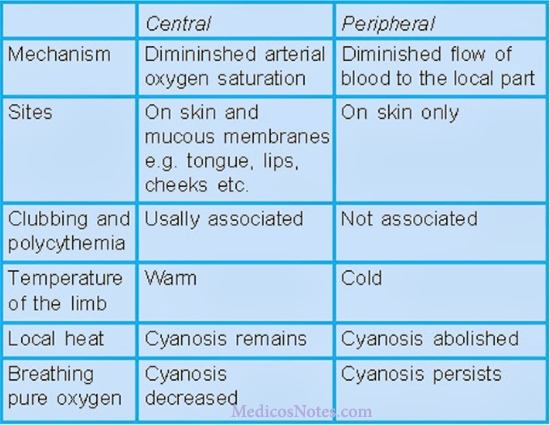 How will you differentiate between central and peripheral cyanosis? Tongue (mainly the margins as well as the undersurface). Mucous membrane of gum. soft palate, cheeks. 2. Due to increased blood flow, on shaking hands the hand feels warm. 5. Clubbing and polycythemia is usually present in association with central cyanosis. Outer aspect of lips, chin and cheek. Tip of fingers and toes. Nail-bed of fingers and toes. 2. Due to decreased blood flow, on shaking hands the hand feels cold. 3. Improvement in cyanosis is noted on application of warmth. 5. Clubbing and polycythemia is usually absent in peripheral cyanosis.